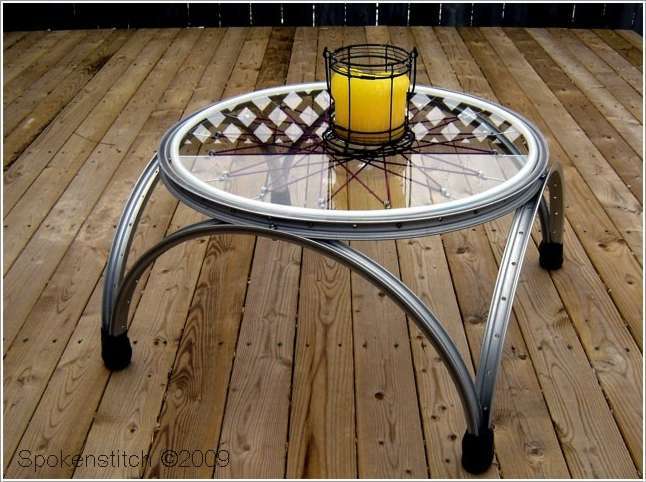 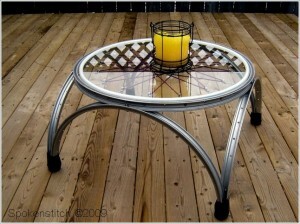 Etsy Shop Spoken Stitch has such an inspirational idea where a bike wheel is turned into a chic coffee table that can add a quick industrial feel to any interior where it is put. Jennifer from Dimples and Tangles got a bike wheel on her birthday with cards that were written for her. 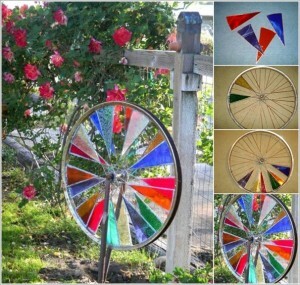 She turned the same bike wheel into a cool picture frame that is now adorning the wall in her office. 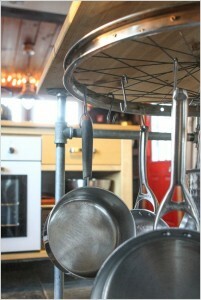 Apartment Therapy has a super cool idea for your kitchen. 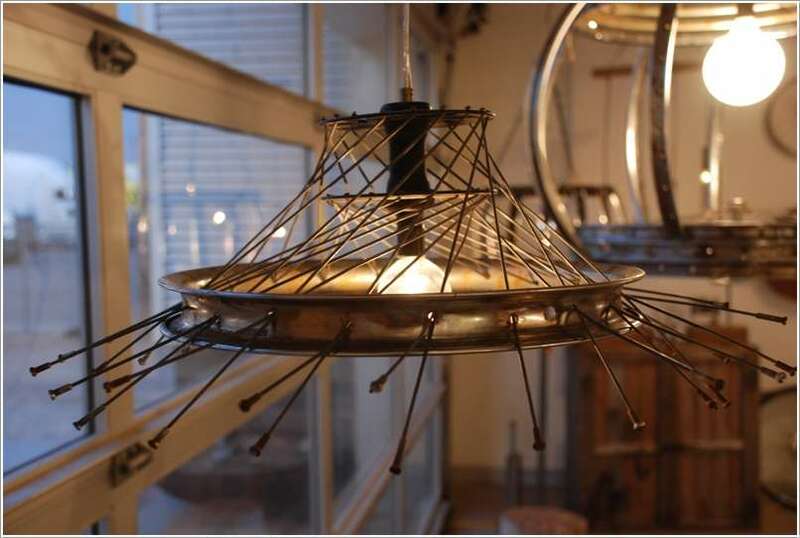 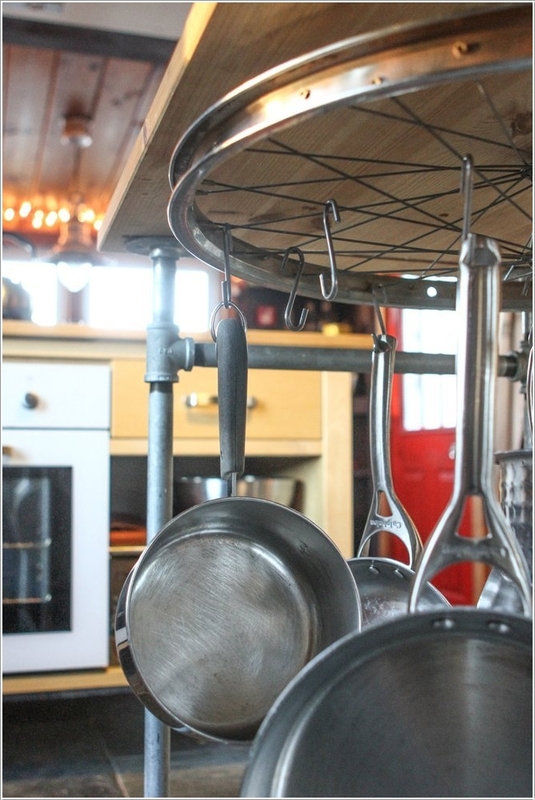 If your pots and pans are not organized and there is no space to keep them, then simply recycle a bike wheel into a hanging pot rack. 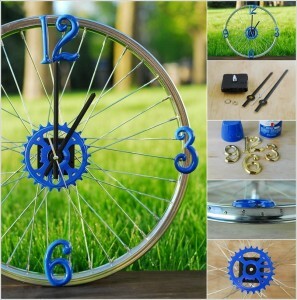 Ingenious, isn’t it? 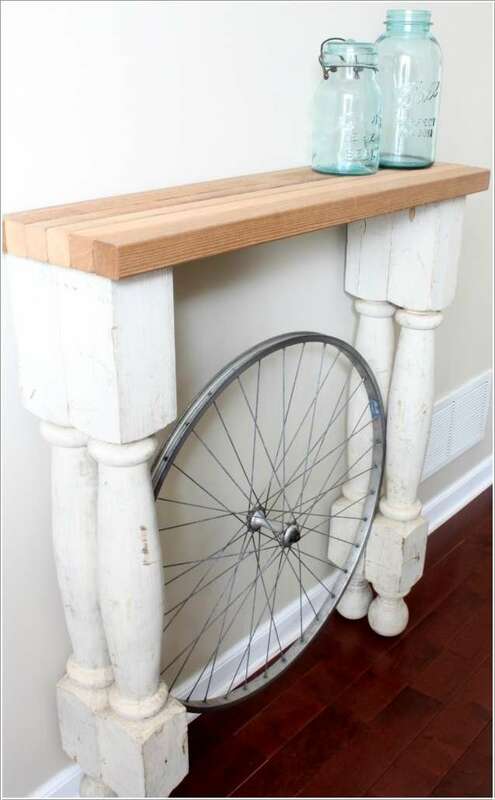 Kimm at Reinvented found four porch posts at a cost of $60 and her husband combined it with a bike wheel and created this lovely foyer table that is a great thing to look at. Tonia Larson at eHow came up with a great idea to recycle a bike wheel as her husband and kids are bike enthusiasts and this bike clock was just the right addition to their home decor. 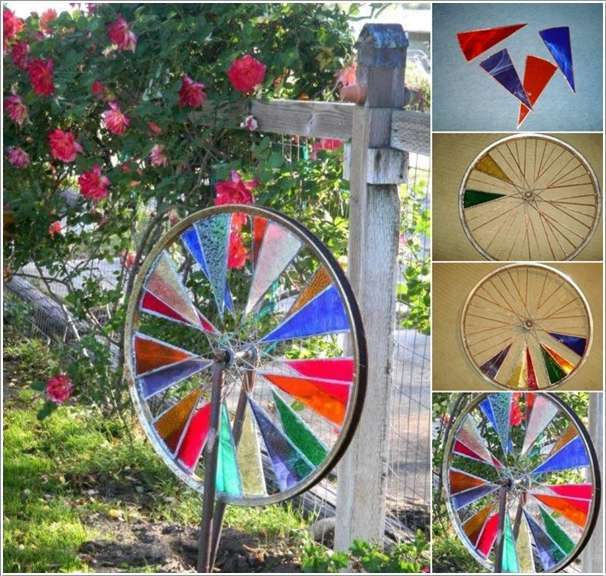 Marie Wirth’s project at Flea Market Gardening won the first place in ‘Upcycled Spring Contest’ and in this project she has created a stained glass spinner by combining painted pieces of glass and a bike wheel. 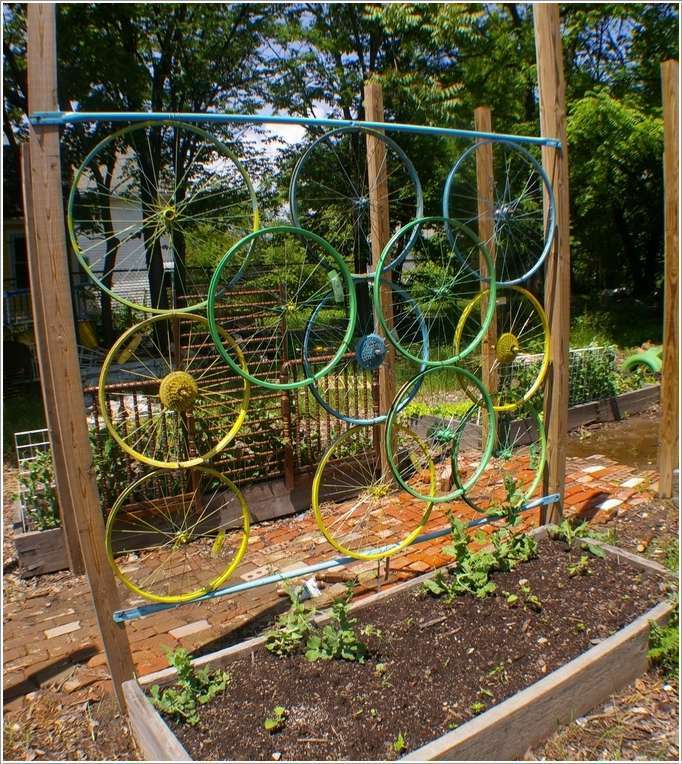 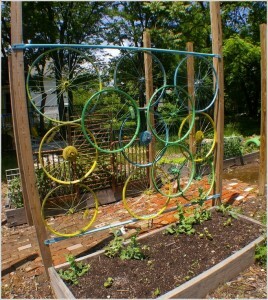 Muppster via Flickr has shared a wonderful project where lots of painted bike wheels are joined and converted into a colorful garden trellis that is an amazing accent in her garden. 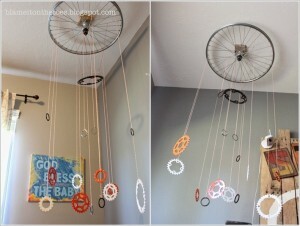 Elizabeth Martin of Blame It On the Toes wanted to decorate her baby’s nursery that had yet to arrive in vintage bicycle theme. 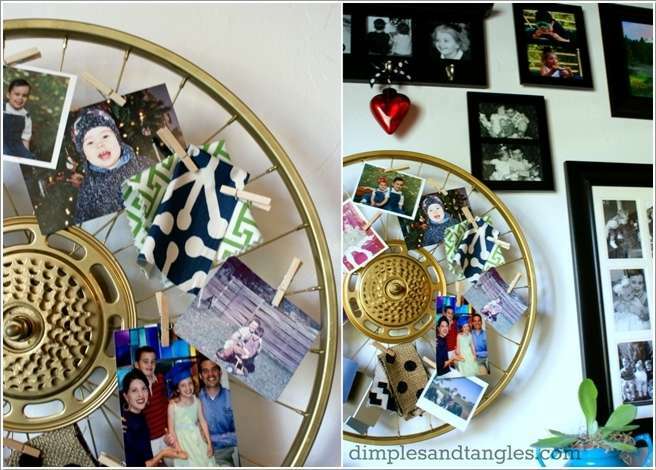 When the baby arrived the nursery wasn’t done yet and her creative husband decorated the whole nursery in one night. 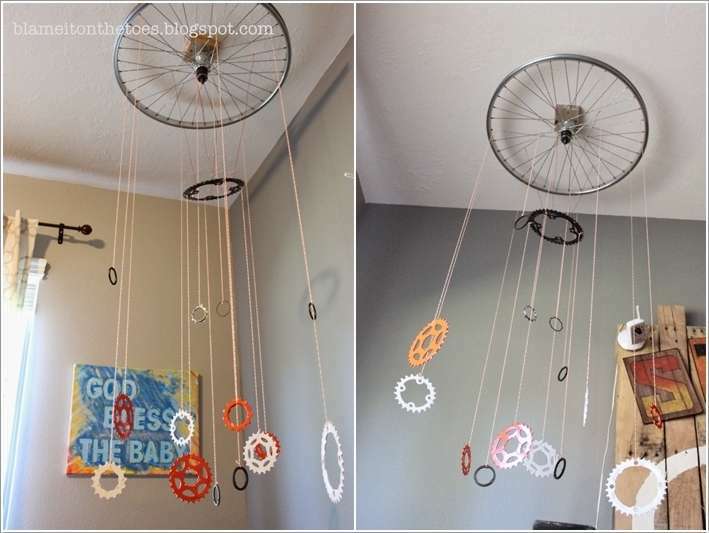 The coolest thing in this nursery is the bicycle wheel mobile that her husband created from his old bicycle as he happens to be a bicycle lover.